We found this under a sink last recently. This is a basement kitchen that is below the sewer for the home and they have installed a sanitary pump to push the waste water up to the sewer line. It STUNK, literally! 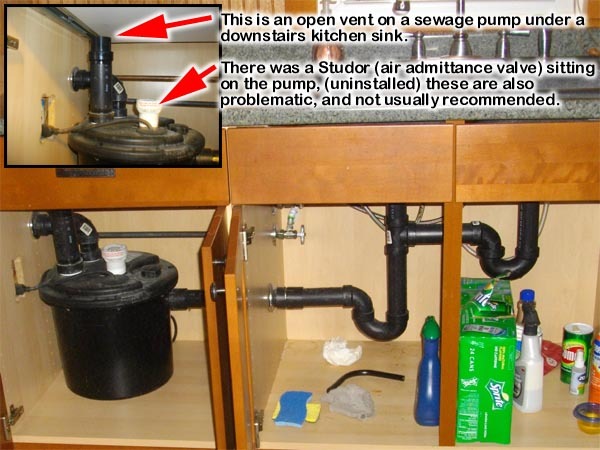 It was allowing sewer gases to escape under the kitchen cabinet. These tanks must be vented to work properly. As water enters the pump basin, there must be a way for air to be displaced. A proper installation would have had this vent pipe go up the wall and exiting through the roof. They had a Studor valve sitting next to the pump. These devices are one-way valves that allow air in but do not allow for sewer gas to escape. In this example, it is not good idea, since as the basin fills with waste water, the air must escape, and as the pump empties it, air must enter the basin.